Jongert E, DE Craeye S, Dewit J, Huygen K.
Toxoplasma Research Unit, WIV-Pasteur Institute of Brussels (Federal Service of Public Health), Brussels, Belgium. In a previous study, single-gene vaccination with GRA1, GRA7 or ROP2 was shown to elicit partial protection against Toxoplasma gondii. In this study, the contribution of each antigen in the evoked humoral and cellular immune responses was evaluated after vaccination with plasmid mixtures containing GRA1, GRA7 and ROP2. Cocktail DNA vaccinated mice developed high antibody titers against the antigens from two-gene DNA vaccine cocktails, but lower titres when immunized with the three-gene cocktail. High numbers of IFN-gamma secreting splenocytes were generated predominantly against GRA7. Brain cyst burden was reduced by 81% in mice vaccinated with the three-gene mixture and they were completely protected against acute toxoplasmosis. Similar high levels of brain cyst reductions were obtained after vaccination with cocktails composed of GRA1 and GRA7 (89% reduction), or GRA7 and ROP2 (79% reduction), but not with the cocktail composed of GRA1 and ROP2. In low dose single-gene vaccinations, IFN-gamma and strong protection could only be elicited by GRA7. Hence, the presence of GRA7 in the DNA vaccine formulation was important for optimal protection and this was correlated with GRA7-specific IFN-gamma production. We propose GRA7 as a main component in cocktail DNA vaccines for vaccination against T. gondii. Rolland D, Raymond F, Gauthier M, Fournier C, Charrier JP, Jolivet M, Dantigny P.
R&D Department, bioMérieux, Marcy l’Etoile, F-69280, France. Many problems concerned with the production and the purification of recombinant proteins must be addressed prior to launching an industrial production process. Among these problems, attention is focused on low-level expression that complicates the purification step and can jeopardise the process. The expression of a membrane protein, rP30, of Toxoplasma gondii in the yeast Schizosaccharomyces pombe led to a secretion of only 0.5mugml(-1). In order to obtain a sufficient quantity for biochemical characterization and evaluation in vitro diagnostic test development, strategies for both production and purification had to be optimized. First, the influence of four nitrogen sources (three peptones and yeast extract) on the growth rate, but also on the separation between the protein and the components of the fermentation broth was assessed. Second, batch and fed-batch fermentations were compared in terms of final biomass and rP30 concentrations. Third, three different protocols that included fixed and expanded bed ion exchange chromatography were compared for processing a large volume of feedstock. By using the most appropriate strategies, i.e. fed-batch fermentation, capture on EBA cation exchanger and affinity chromatography polishing, a purification factor of 1778 and a yield of 49% were achieved. These performances allowed a 12.5-fold increase for the overall rP30 process productivity. Cellular Biology, University of Georgia, Athens, GA 30606. Farnesyl diphosphate synthase (FPPSs) catalyzes the synthesis of farnesyl diphosphate (FPP), an important precursor of sterols, dolichols, ubiquinones and prenylated proteins. We report the cloning and characterization of two Toxoplasma gondii farnesyl diphosphate synthase (TgFPPS) homologs. A single genetic locus produces two transcripts, TgFPPS and TgFPPSi, by alternative splicing. Both isoforms were heterologously expressed in Escherichia coli, but only TgFPPS was active. The protein products predicted from the nucleotide sequences have 646 and 605 amino acids and apparent molecular masses of 69.5 and 64.5 kDa, respectively. Several conserved sequence motifs found in other prenyl diphosphate synthases are present in both TgFPPSs. TgFPPS was also expressed in the baculovirus system and was biochemically characterized. In contrast to the FPPSs of other eukaryotic organisms, TgFPPS is bifunctional, catalyzing the formation of both farnesyl diphosphate (FPP) and geranylgeranyl diphosphate (GGPP). TgFPPS localizes to the mitochondria, as determined by the co-localization of the reaction of affinity-purified antibodies against the protein with MitoTracker, and in accord with the presence of an N-terminal mitochondrial-targeting signal in the protein. This enzyme is an attractive target for drug development, since the order of inhibition of the enzyme by a number of bisphosphonates is the same to that for inhibition of parasite growth. In summary, we report the first bifunctional farnesyl diphosphate/geranylgeranyl diphosphate synthase identified in eukaryotes, which, together with previous results, establishes this enzyme as a valid target for the chemotherapy of toxoplasmosis. 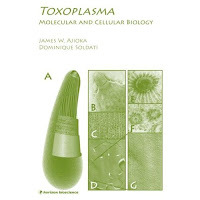 Apicomplexan parasites are important disease causing organisms that infect both animals and humans, causing extensive health and economic damage to human populations, particularly those in the developing world. The ability to perform genetic crosses, to engineer transgenic parasites lines, and the wealth of information made available through recent genome sequencing projects have made the laboratory study of these parasites important not only for understanding the diseases that they cause, but also for gaining insights into basic biological processes. The control of gene expression and cellular differentiation are particularly interesting in these organisms, as the apparent lack of large families of recognizable transcription factors typically found in other eukaryotic organisms suggests that they may be unusually reliant on epigenetic mechanisms. Here we review recent advances in the study of epigenetic gene regulation in the apicomplexan parasites Plasmodium falciparum and Toxoplasma gondii. Department of Cellular Biology and Center for Tropical and Emerging Global Diseases, University of Georgia, Paul D. Coverdell Center, 500 D.W. Brooks Drive, Athens, Georgia 30602, U.S.A.
Members of the phylum Apicomplexa include the causative agents of numerous important human and life-stock diseases. Apicomplexans are obligate intracellular pathogens and have adapted to a diverse range of hosts and host cells. A key component to the parasite's success is its ability to secure the supply of essential nutrients and metabolic building blocks. Here we focus on fatty acid metabolism, an area that has recently received considerable attention due to its value as a parasite specific drug target. Apicomplexans, long thought to lack the ability to synthesize fatty acids, rely on three independent synthesis pathways, suitable for a parasite some of them apparently taken from other organisms: a fatty acid synthesis (FAS) II pathway obtained with the acquisition of an algal endosymbiont, FASI and polyketide synthases of apparent bacterial origin, and a set of fatty acid elongases. We provide a comparative genomic analysis of these surprisingly diverse pathways for Toxoplasma, Plasmodium, Cryptosporidium and Theileria. Despite this obvious biosynthetic capability apicomplexans also heavily salvage fatty acids and other lipids from their hosts, and mechanistic insights into this process have begun to emerge. We discuss the dramatic recent progress in our understanding of how apicomplexans make and take fatty acids in the light of metabolic adaptation to specific host cell niches. The Department of Microbiology & Immunology at the Albert Einstein College of Medicine (AECOM) is recruiting four new tenure track faculty at the Assistant or Associate Professor levels. Applicants should hold a Ph.D. or M.D. degree, and have a strong record of accomplishment in basic or translational research relevant to microbial pathogenesis, host-pathogen interactions or immunology. Qualified candidates with background in areas of research related to biodefense pathogens or emerging infectious diseases are particularly encouraged to apply. The available position offers competitive salary and start-up funds, new or recently renovated laboratory space, and access to numerous state-of-the-art core facilities. Extensive BSL-2 and BSL-3 containment facilities are available for handling infectious agents and infected rodents. The Department has active NIH Training Grants available for support of pre- and postdoctoral trainees, and there is excellent access to outstanding research trainees through the large PhD and MD/PhD programs at AECOM. The campus is located in a secure and attractive neighborhood in the northern borough of New York City in close proximity to the Bronx Zoo and Botanical Gardens, Manhattan and the suburban areas of Westchester County and Long Island (for more information about AECOM, visit our website at www.aecom.yu.edu). Pawlowski NN, Struck D, Grollich K, Kuhl AA, Zeitz M, Liesenfeld O, Hoffmann JC. Innere Medizin I, St. Marienkrankenhaus, Salzburger Straβe 15, D67067 Ludwigshafen, Germany. joerg.hoffmann@charite.de. AIM: To investigate whether bowel inflammation and/or parasite control is altered in the absence of the T cell adhesion molecule CD2. METHODS: Wildtype (WT) and CD2 deficient (CD2(-/-)) mice were infected with 100 cysts of Toxoplasma gondii (T. gondii) (ME49) by gavage. On d 7 after infection mice were killed. Necrosis and the number of parasites/cm ileum were determined. Cytokine levels of stimulated cells as well as sera were evaluated. Secondly, survival of WT vs CD2(-/-) mice was analysed using Kaplan-Meier analysis. RESULTS: CD2(-/-) mice survived longer than WT mice (mean: 23.5 vs 7.1 d, P = 0.001). Further, CD2(-/-) mice showed less weight loss and less ileal inflammation than WT mice at d 7 post infection. In addition, the number of parasites in the ileum was significantly lower in CD2(-/-) mice than in WT mice (88 +/- 12 vs 349 +/- 58 cm, P < 0.01). This was paralleled by lower production of IFN-gamma and IL-6 from TLA-stimulated mLN cells and increased IFN-gamma production by splenocytes. CONCLUSION: CD2 deficient mice are more resistant to T. gondii infection than WT mice. In contrast to most current immunosuppressive or biological therapies CD2 deficiency reduces intestinal inflammation and at the same time helps to control infection. Thomas NJ, Dubey JP, Lindsay DS, Cole RA, Meteyer CU. Department of the Interior, US Geological Survey, National Wildlife Health Center, Madison, WI. Protozoal meningoencephalitis is considered to be an important cause of mortality in the California sea otter (Enhydra lutris). Thirty nine of 344 (11.3%) California (CA) and Washington state (WA) sea otters examined from 1985 to 2004 had histopathological evidence of significant protozoal meningoencephalitis. The aetiological agents and histopathological changes associated with these protozoal infections are described. The morphology of the actively multiplicative life stages of the organisms (tachyzoites for Toxoplasma gondii and merozoites for Sarcocystis neurona) and immunohistochemical labelling were used to identify infection with S. neurona (n=22, 56.4%), T. gondii (n=5, 12.8%) or dual infection with both organisms (n=12, 30.8%). Active S. neurona was present in all dual infections, while most had only the latent form of T. gondii. In S. neurona meningoencephalitis, multifocal to diffuse gliosis was widespread in grey matter and consistently present in the molecular layer of the cerebellum. In T. gondii meningoencephalitis, discrete foci of gliosis and malacia were more widely separated, sometimes incorporated pigment-laden macrophages and mineral, and were found predominantly in the cerebral cortex. Quiescent tissue cysts of T. gondii were considered to be incidental and not a cause of clinical disease and mortality. Protozoal meningoencephalitis was diagnosed more frequently in the expanding population of WA sea otters (10 of 31, 32.3%) than in the declining CA population (29 of 313, 9.3%). Among sea otters with protozoal meningoencephalitis, those that had displayed neurological signs prior to death had active S. neurona encephalitis, supporting the conclusion that S. neurona is the most significant protozoal pathogen in the central nervous system of sea otters. Department of Molecular Microbiology, Washington University School of Medicine, 660 S. Euclid Ave., St. Louis, MO 63110, Department of Cellular Biology and Center for Tropical and Emerging Global Diseases, Paul D. Coverdell Center for Biomedical and Health Sciences, University of Georgia, Athens, GA 30602. Artemisinin is a plant sesquiterpene lactone that has become an important drug for combating malaria, especially in regions where resistance to other drugs is widespread. While the mechanism of action is debated, artemisinin has been reported to inhibit the sarcoplasmic endoplasmic reticulum Ca(2+) ATPase (SERCA) in malaria. Artemisinin is also effective against Toxoplasma in vitro and in vivo, although it is less potent and hence generally not used therapeutically to treat toxoplasmosis. To explore the mechanism of action, we generated chemically derived mutants of T. gondii that were resistant to growth inhibition by this compound in vitro. Three artemisinin resistant (ART(R)) mutant clones were obtained that differed in their sensitivities in vitro by 3-5 fold vs. wild type parasites. ART(R) mutants were cross-resistant to other derivatives of artemisinin, the most potent of which was artemisone. Resistance was not due to molecular alterations or expression differences in SERCA, or other putative targets such as MDR or translationally-controlled tumor protein (TCTP). ART(R) mutants were resistant to the induction of protein secretion from micronemes, a calcium-dependent process that is triggered by artemisinin. ART(R) mutants were not cross-resistant to induced secretion by thapsigargin, but were more sensitive and were unable to regulate cytoslic calcium following treatment with this compound. These studies implicate calcium homeostasis in the mechanism of action of artemisinins against apicomplexan parasites. AUTHORS Fleige,T., Limenitakis,J., Foth,B. and Soldati,D. The spread of parasitic resistance has necessitated the development of new drugs and drug targets for the treatment of malaria. Microtubules, which have gained outstanding importance as target molecules for the development of anticancer drugs, are likely to be potent antimalarial targets. The clinical implementation of microtubule inhibitors has given rise to a detailed mechanistic understanding of their interaction with tubulin on the molecular level and their effects on the cellular level. By comparison, our knowledge on Plasmodium falciparum, the causative agent of the most severe form of malaria, is rather poor. This article gives an overview on the microtubule inhibitors that have been explored in the parasite, reviews their effects on parasite growth and assesses their potential as novel antimalarials. Department of Biological Sciences, Stanford University, Stanford, CA 94305-5020, USA. Parasite Toxoplasma gondii blocks the innate aversion of rats for cat urine, putatively increasing the likelihood of a cat predating a rat. This is thought to reflect an adaptive behavioral manipulation, because toxoplasma can reproduce only in cat intestines. While it will be adaptive for the parasite to cause an absolute behavioral change, fitness costs associated with the manipulation itself suggest that the change is optimized and not maximized. We investigate these conflicting suggestions in the present report. Furthermore, exposure to cat odor causes long-lasting acquisition of learnt fear in the rodents. If toxoplasma manipulates emotional valence of cat odor rather than just sensory response, infection should affect learning driven by the aversive properties of the odor. As a second aim of the present study, we investigate this assertion. We demonstrate that behavioral changes in rodents induced by toxoplasma infection do not represent absolute all-or-none effects. Rather, these effects follow a non-monotonous function dependent on strength of stimulus, roughly resembling an inverted-U curve. Furthermore, infection affects conditioning to cat odor in a manner dependent upon strength of unconditioned stimulus employed. Non-monotonous relationship between behavioral manipulation and strength of cat odor agrees with the suggestion that a dynamic balance exists between benefit obtained and costs incurred by the parasite during the manipulation. This report also demonstrates that toxoplasma affects emotional valence of the cat odor as indicated by altered learned fear induced by cat odor. Ovine toxoplasmosis, caused by the intracellular protozoan parasite Toxoplasma gondii, was first described in 1954 and while the incidence of ovine infection is difficult to define, it has been reported that in the UK it is responsible for between 1 and 2% of neonatal losses per annum. Recent reports have suggested that sheep persistently infected with T. gondii may pass infection to the fetus in subsequent pregnancies more readily than previously thought. These data show a high proportion of both successful and failed pregnancies in sheep to be positive by PCR for T. gondii with a tendency for samples from certain genetic lines of Charollais sheep more likely to be positive than samples from other lines, suggesting that some sheep have a particular genetic susceptibility to T. gondii. Department of Molecular Microbiology and Immunology, Warren Alpert Medical School, Brown University, Providence, RI 02912. Autophagy has been implicated in the intracellular destruction of Toxoplasma gondii by primed macrophages following IFNgamma activation of p47 GTPases. CD40 ligation has also been shown to trigger autophagic elimination of T. gondii independently of gamma interferon and p47 GTPases. Here we demonstrate that IFNgamma/p47 GTPase-dependent elimination of T. gondii by CPS-vaccine primed macrophages is independent of CD40/TNF signaling. Similar to WT controls, both CD40-deficient and TNFR1/2-deficient macrophages can efficiently eliminate invaded GFP-PTG and restrain their replication following priming. In contrast, IFNgammaR(-/-) macrophages neither clear the parasites nor repress their proliferation. Thus, CD40 and IFNgamma-induced pathogen elimination might represent two independent resistance pathways, the latter playing a primary role in anti-Toxoplasma immunity in mouse.